As we age, the natural fat that surrounds the cheekbones indicating youth deteriorates, resulting in the loss of volume and definition. The collagen and protein that allow our skin to retain its original shape also break down. The resulting hollow cheeks and sagging skin become more apparent as gravity takes its toll. All of these issues however are addressable at MD Aesthetica with the help of our Aesthetic Injection Specialists and Restylane Lyft in Houston, Texas. Formerly known as Perlane, Restylane Lyft is an injectable hyaluronic acid gel from the Restylane family of products that is FDA-approved to lift cheeks, replenish volume, and contour the face by smoothing away wrinkles and smile lines. Restylane Lyft was created by Galderma, one of the most trusted names in skincare, and uses larger particles that are injected deeper to improve skin elasticity and produce a more natural look. It provides the sculpted high cheekbones that you want and smooths out nasolabial folds, commonly known as laugh or smile lines. The transparent gel is specifically formulated to perform like the hyaluronic acid naturally produced by your body. The formula is injected deep into the dermis to the superficial subcutis in order to correct moderate-to-severe facial wrinkles and folds. The procedure can also augment your cheeks to treat age-related mid-face contour deficiencies or hollow cheeks caused by weight loss. Because Restylane Lyft uses hyaluronic acid, there are few restrictions. The use of hyaluronic acid also limits the potential for adverse side effects. Restylane Lyft is a safe, cost-effective option to help you confidently obtain noticeable, long-lasting natural results. Md Aesthetica by Dr.Lyos is one of the highest-rated aesthetic injection practices in the United States and has been recognized by Galderma as a top-rated injectables clinic. Our providers are experienced injectors who often lecture and instruct other medical professionals on proper injection techniques. Schedule for a consultation with our Houston practice today and find out how we can help you achieve your anti-aging goals. 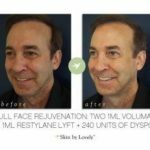 How Long Does a Restylane Lyft Treatment Take at MD Aesthetica? During your consultation, our experienced MD Aesthetica staff will provide an in-depth presentation of the procedure. This will allow you the opportunity to discuss your cosmetic goals. We will evaluate your facial structure and determine the amount of filler required to achieve the desired results. The medical staff will also review your health history during your office visit to ensure that there are no risks associated with treatment, such as a known allergy or medications that could interact with any of the ingredients in Restylane Lyft. How Much Does Restylane Lyft Cost at MD Aesthetica? Is it Affordable? Since every patient is different in terms of goals and condition, the cost associated with treatment will vary. During your consultation, your provider will determine exactly how much product is needed to provide you with the desired results. This will help us determine the cost of treatment. We will give you a quote for your treatment prior to performing the procedure. 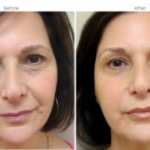 As Restylane Lyft lasts for several months, the treatment itself is considered an affordable option for facial rejuvenation, with touch-up treatments often requiring less product than the initial procedure. Restylane Lyft at MD Aesthetica Houston typically starts around $650. What are My Payment Options for Restylane Lyft at MD Aesthetica? We accept cash, major credit cards, and CareCredit as payment for Restylane Lyft and other treatments in our Santa Monica and Portland aesthetics practices. Contact us today for a consultation and to find out is Restylane Lyft is right for you.